As we look ahead to World Oceans Day next month, we wanted to share a video from an Earth Day event at the Aquarium. 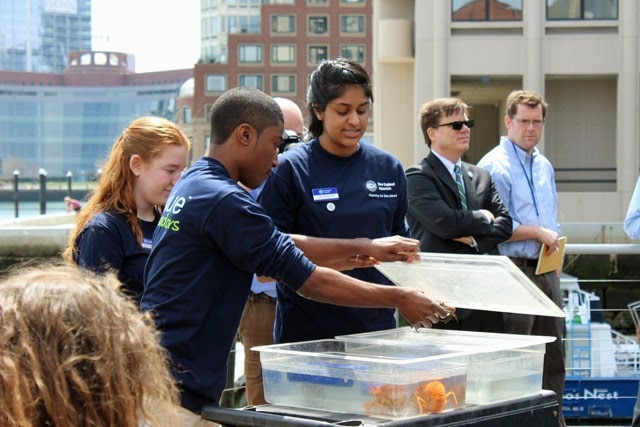 Boston Harbor served as a backdrop as Aquarium teens interacted with environmental, local and national political leaders. The topic: challenges facing oceans today. Local news outlet Boson Neighborhood Network was there and spoke with teens about why they're passionate about climate change issues and how they're motivating their peers. Elected officials and political leaders also touched on climate change issues and the impact it has on people and the economy. Earth Day Education at N.E. Aquarium from Chris Lovett on Vimeo. At the event, teens presented on a variety of topics including the effect of warming waters on the declining range of lobsters in New England and the effects of ocean acidification on all marine animals with shells. Long glass tubes filled with sea jellies were displayed to show how they are the only group of marine animals that thrive as ocean waters become warmer, more polluted and more oxygen deprived. Lastly, another teen group spoke about the effects of sea level rise in Boston Harbor.